The National Digital Inclusion Alliance has just released Worst Connected Cities 2017. 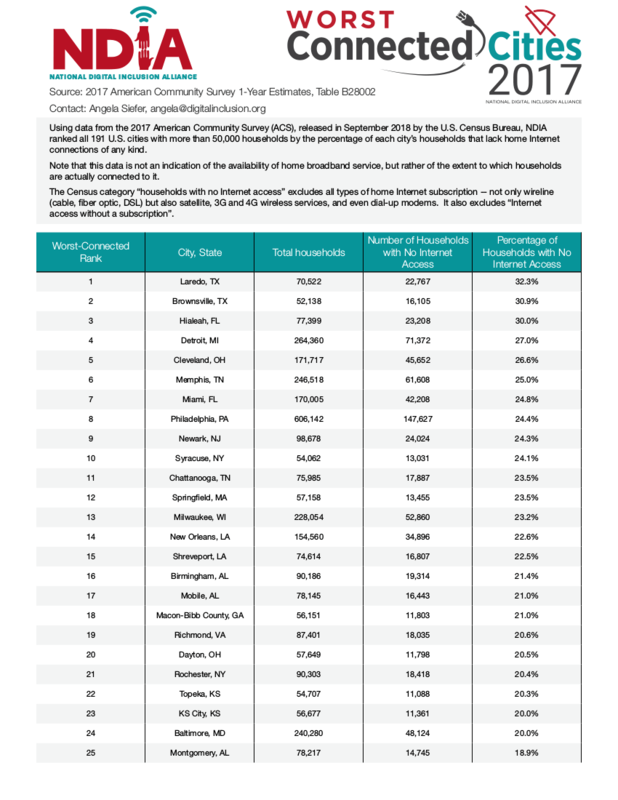 It’s based on the same American Community Survey data as CYC used in this post, but includes many smaller cities (the cutoff point is 50,000 households, not the 100,000 we used) and looks at a different metric: The percentage of households who told the Census they have no home Internet access of any kind. That means no smartphones, no satellite dishes, no dial-up connections and no “Internet access without a subscription”. No connections at all. So where does Cleveland rank among the 191 cities included in this comparison? Our city is fifth worst-connected among all these cities, with almost 27% of our households still lacking home Internet access of any kind in 2017. According to the Census estimate, that’s about 45,000 Cleveland homes where residents can’t get on line to search for jobs, do homework, shop, bank, find health information, check the weather or bus schedule, keep up with news and civic affairs, or use email and social media to communicate with employers, family and friends.